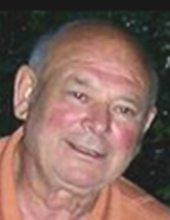 Ronald James “Ron” Joslyn, age 86, of Cascade, WI, passed away peacefully on April 10, 2019, at Sharon S. Richardson Community Hospice in Sheboygan Falls. He was born March 25, 1933, son of the late Walter N. and Helen (Jamiska) Joslyn in Chicago, IL, where he lived until 1943 and then spent his childhood on the family farm in Cascade. Ron went on to graduate from Plymouth High School as the class of 1950 Vice President. Ron joined the United States Navy following graduation and earned the rank of Electronic Technician 2nd class. He spent time on submarines and taught Navy ROTC students at Miami University in Oxford, Ohio. He attended the University of Florida in Gainesville, where he earned his Bachelor of Science Degree in Industrial Engineering. It was in Oxford that Ron met and married Cecilia “Bonnie” Bonbright. They had four children, Daniel, Steven, Tarry, and Katie and were married 24 years. During that time, he worked for Westinghouse, Collins Radio, Railway Express, Price Waterhouse, and Johnson Controls. On March 21, 1987, Ron married Barbara Boll-Fritz. They lived together on the Joslyn family homestead until his passing. For many years Ron was the owner and operator of General Business Services and served on the Planning Commission Board for the Town of Lyndon. Ron enjoyed spending time with his family and many friends. He also loved to travel in his camper and often took it for weekend events at Road America. He had a passion for fishing, reading and general tinkering, and was great at grilling. Later in life, Ron enjoyed time at home building log fires and playing computer games. He was a kind, loving, smart, and caring husband, father, grandfather, and friend. He had a wonderful sense of humor and will be greatly missed by all. Survivors include: Wife: Barbara; Four children: Daniel (Karol) Joslyn of Crystal Lake, Steven Joslyn of Arden, NC, Tarry (Butch) Blanke of Black Earth, WI, and Katie (Mike) Roberts of Cascade; Step-children: Robin (Ken) Ivey of Manitowoc, Brian (Vickie) Fritz of Gainesville, GA, Perry (Lori) Fritz of Sheboygan, and Gary Fritz of New Berlin; 15 Grandchildren; and Brother-in-law: Jerry Boll of Sheboygan. He is also survived by many nieces, nephews, other relatives and friends. Ron was preceded in death by his parents, and brother, Robert (Bonnie) Joslyn. A Celebration of Ron’s Life will be held on Tuesday (April 16, 2019) at 6:00 P.M. at the Suchon Funeral Home in Plymouth. Rev. Tom Fleischmann will officiate. Visitation will take place at the Suchon Funeral Home on Tuesday (April 16) from 4:00 P.M. until the time of services. In lieu of flowers, a memorial fund is being established in Ron’s name. The Suchon Funeral Home and Cremation Services is assisting the family. For online condolences please visit, www.suchonfh.com. The family would like to send special thanks to the staff on the 3rd floor at Aurora Sheboygan Memorial Hospital and also the staff of Sharon S. Richardson Hospice, for the wonderful care given to Ron. To send flowers or a remembrance gift to the family of Ronald J. Joslyn, please visit our Tribute Store. "Email Address" would like to share the life celebration of Ronald J. Joslyn. Click on the "link" to go to share a favorite memory or leave a condolence message for the family.